OCTOBER 11, 2018, Richmond, Va.—Berkshire Hathaway HomeServices PenFed Realty, one of the country’s fastest-growing real estate brokerages, today announced that real estate industry veteran and Richmond native Ray Ferguson has joined the company as vice president of sales operations for the Mid-Atlantic region’s Central Virginia operations. Ferguson, a top-producing real estate professional with almost 30 years of experience, will be responsible for the day to day sales operations of the company’s Richmond-area offices. He brings a combination of extensive sales experience, operations knowledge and local market expertise to his work in pursuit of the company’s aggressive growth and expansion strategy in the Central Virginia region. Ferguson, who has spent his entire career serving the needs of home buyers and sellers in the Richmond metro area, has consistently placed within the top one percent of sales associates in Central Virginia. Born and raised in Richmond, Ferguson has deep ties and is an active volunteer within the community. He is a longtime member of the Tuckahoe Jaycees and has held many offices within the organization, including chairman and president. 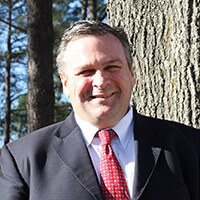 He is currently the president of Henrico Business Leaders and serves as the chapter adviser for the Order of the Arrow Cardinal District of Boy Scouts of America. Ferguson lives with his wife, Carole, in Richmond’s Short Pump area, where they raised their two Eagle Scout sons, William and Zachary. Berkshire Hathaway HomeServices PenFed Realty (www.penfedrealty.com) is a full-service real estate company with an annual sales volume of almost $5 billion. The company has 1,800 agents and more than 50 offices, providing complete real estate services nationwide. PenFed Realty is a wholly-owned subsidiary of PenFed Credit Union and is a member of the Berkshire Hathaway HomeServices brokerage network, operated by HSF Affiliates LLC. We are proud to be an equal employment opportunity employer. Equal Housing Opportunity. ← Welcome to our newest team members!